Two centuries of Viking raids into Europe tapered off following the adoption of Christianity by King Olav Tryggvason in 994. Conversion of the Norwegian kingdom occurred over the next several decades. 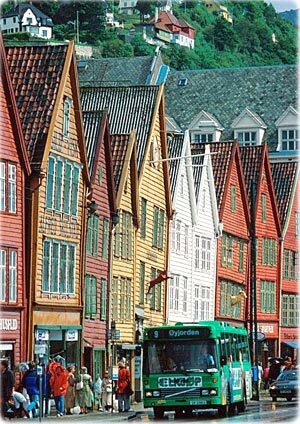 In 1397, Norway was absorbed into a union with Denmark that was to last for more than four centuries. In 1814, Norwegians resisted the cession of their country to Sweden and adopted a new constitution. Sweden then invaded Norway but agreed to let Norway keep its constitution in return for accepting the union under a Swedish king. Rising nationalism throughout the 19th century led to a 1905 referendum granting Norway independence. During the World War II, was invaded by Germany. Discovery of oil and gas in adjacent waters in the late 1960s boosted Norway's economic fortunes. The current focus is on containing spending on the extensive welfare system and planning for the time when petroleum reserves are depleted. In referenda held in 1972 and 1994, Norway rejected joining the EU. 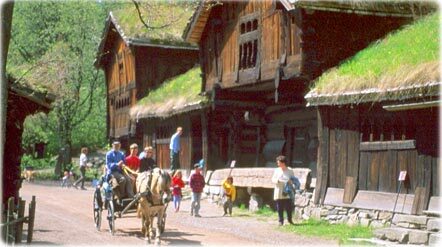 Folk Museum in Oslo, Norway. Travel Europe Countries. Scandinavia. Norge. Country name: Kingdom of Norway (local: Kongeriket Norge). 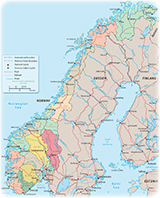 Administrative divisions: 219 provinces (fylker, singular - fylke); Akershus, Aust-Agder, Buskerud, Finnmark, Hedmark, Hordaland, More og Romsdal, Nordland, Nord-Trondelag, Oppland, Oslo, Ostfold, Rogaland, Sogn og Fjordane, Sor-Trondelag, Telemark, Troms, Vest-Agder, Vestfold. Dependent areas: Bouvet Island, Jan Mayen, Svalbard. Terrain: glaciated; mostly high plateaus and rugged mountains broken by fertile valleys; small, scattered plains; coastline deeply indented by fjords; arctic tundra in north. Coastline: 21,925 km (includes mainland 3,419 km, large islands 2,413 km, long fjords, numerous small islands, and minor indentations 16,093 km). Highest point: Galdhopiggen 2,469 m.
Climate: Temperate along coast, modified by North Atlantic Current; colder interior with increased precipitation and colder summers; rainy year-round on west coast. Ports and harbors: Bergen, Drammen, Floro, Hammerfest, Harstad, Haugesund, Kristiansand, Larvik, Narvik, Oslo, Porsgrunn, Stavanger, Tromso, Trondheim. Note: about two-thirds mountains; some 50,000 islands off its much indented coastline; strategic location adjacent to sea lanes and air routes in North Atlantic; one of most rugged and longest coastlines in world. Population growth rate: 0.41 % (2004 est.). Life expectancy at birth: 79.3 years. Religions: Church of Norway (Evangelical Lutheran - official) 71.5%, Roman Catholic 2.8%, other Christian 3.9%, Muslim 2.8%, other 2%, unspecified 7.5% (2016 est.). Ethnic groups: Norwegian 83.2% (includes about 60,000 Sami), other European 8.3%, other 8.5% (2017 est.). Language: Bokmal Norwegian (official), Nynorsk Norwegian (official) note: small Sami- and Finnish-speaking minorities.